Air hostess salary in India is very high, which makes the job even more exciting. There are also other excellent benefits that air hostesses enjoy. Visiting distant cities and foreign countries is the major attraction of this job. Excitement apart, an air hostesses’ job also involves hard work, extra efforts and often, risks involved in tackling unruly passengers and in worse cases, hijackers or terrorists. Hence, working as air hostess is definitely not a job for everyone, regardless of their physical beauty or etiquette. Salaries and allowances are another reason that attracts young women and men to work as cabin crew. Air hostess salary varies according to airline and whether you are deployed on domestic or international routes. But first, let us understand the meaning of the word air hostess and cabin crew. The term ‘air hostess’ is very archaic and considered derogatory in some countries. Hence, there was some disagreement among airline staff over use of this phrase to describe their duties and work title. After some thought, the term ‘flight stewardess’ for females and ‘flight steward’ for males was coined. Yet, these phrases too had shortcomings: they were directly derived from stewardesses and stewards that work on cruise liner. In our era, the correct term to describe an ‘air hostess’ or ‘flight stewardess’ is cabin crew. The term is widely accepted worldwide by all airlines and is standard used by International Air Transport Association (IATA) and International Civil Aviation Organization (ICAO), an apex body of countries and their flag carrier airlines, that functions under United Nations. Cabin crew is acceptable since it does not specify gender of the staff: it is common to both female and male. According to figures gleaned from assorted sources, here are median salaries paid by Indian carriers to their air hostesses/ cabin crew. Here are median salaries for entry level air hostesses to those with two years of experience. These figures can fluctuate wildly, depending upon exchange rates of the Indian Rupee with local currencies of the country where the airline is registered. These salaries are only indicative. Actual air hostess salary depends upon number of hours you fly every month and various other factors. If you want to become an air hostess for an airline, here are some salary guidelines. Worldwide, there are two types of airlines. Full Service Carriers (FSCs): That offer complimentary meals, alcoholic drinks and other beverages to passengers. Low Cost Carriers (LCCs): Passengers flying LCCs get only free drinking water. They have to pay heavily for meals and drinks bought on board the aircraft. Your salary will be decided according to the type of carrier- FSC or LCC you work for. Further, it will also depend upon which airline you work with- Indian or foreign. Usually, foreign airlines pay higher. The fatter pay packet is because the airline needs your specific cultural and linguistic skills to interact with Indian passengers when operating flights to this country. FSCs pay higher because it involves serving drinks and meals to passengers. They also feature Business Class and First Class cabins where flyers are given extra care by airline, since they pay phenomenally higher that Economy Class passengers. Hence, Business Class and First Class passengers are served better meals and expensive drinks compared over Economy Class. Most FSCs operate in-flight Duty Free shopping on international routes. This means, cabin crew have the added responsibility of promoting stuff sold on board the aircraft, collect and maintain records of payments. FSCs operate on long, inter-continental routes. This means you get allowances for stay in foreign countries. Generally, cabin crew salaries on LCCs are lower. This is because lesser inflight work is involved. LCCs carry lesser cabin crew. In fact, they carry only the bare minimum required for passenger safety as stipulated by ICAO. Some LCCs flying on international routes also offer inflight Duty Free shopping. But in most cases, selection is very limited and hence attracts few takers. Few LCCs operate on foreign routes. Hence, the scope for earning allowance for stay in foreign country is limited. Flight Duty Time Limitation (FDTL) is a standard applied by ICAO and other international bodies governing civil aviation. Putting it simply, airline pilots and cabin crew or air hostesses cannot fly more than a specified number of hours per week or per month. FDTL is enforced to ensure pilots and cabin crew are not overworked and do not suffer from fatigue and disorientation caused by long hours of flying. Most airlines pay a fixed salary. But allowances and other perks depend upon how many flying hours you log in per month. India is witnessing a boom in civil aviation. There are several major airlines that crisscross this country and mark India’s presence abroad. Hence, there is a huge demand for air hostesses/ cabin crew in India. Here are some top employers for air hostesses/ cabin crew in India. Air India: The oldest and only airline owned by the Indian government. Jet Airways: India’s most successful and oldest privately owned airline. Vistara: Joint Venture between Tata Group of India and Singapore International Airlines Ltd. The carrier is officially called Tata-SIA Airlines but is promoted under brand ‘Vistara’. Air India Express: This is the LCC operated by Air India and flies primarily on routes between India and countries of the Arabian Gulf. IndiGo: A large LCC in India that also has operations to select countries in the Far East and Middle East. SpiceJet: One of the bigger LCCs of India that flies to most destinations within India and select foreign cities. GoAir: An upcoming LCC of India with limited operations across India and handful of foreign destinations. AirAsia India: A JV between Tata Sons and Malaysia based Air Asia Sendirian Berhad, the world’s largest LCC. Most women and men join an airline as Flight Attendant. They draw the basic salary we mention above plus various allowances. After putting in two years of service or completing FDTL requirements, the salary of air hostess/ cabin crew increases. Promotions are usually given in the following category. These designations vary according to airline and are just an indicator of promotions available for air hostess/ cabin crew. An air hostess salary can increase if they change jobs to join an airline that pays higher, since you have required experience. However, the airline will train you to provide in-flight service according to their standard protocol. 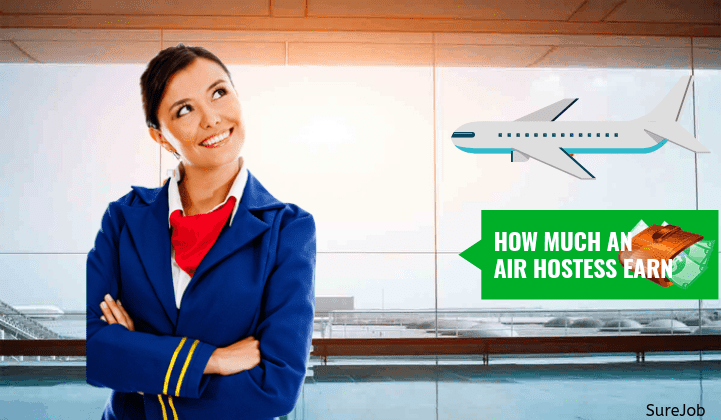 This information should help you know air hostess salary or income of cabin crew in India. Selecting a proper airline will enable you to get more salary. Of course, you can join an airline now as air hostess on lower salary and move upwards on echelons of this profession. Next articleDo you know Salary of President of India & Other Perks? How to apply to become your crew…I am willing learn. Can I apply dis job ?